This lovely pineapple has been sitting on my counter for days. Staring me down. Saying “What’chu gonna do with me? I’m gettin’ ripe over here!” You know it’s time to get cooking when your ingredients start talking to you. Grilled pineapple has got to be one of my top 10 favorite things to work with. It’s simply delish by itself. Chopped up in grain salad with mustard vinaigrette is so good too. Or try a drenching of homemade caramel sauce. It just kills! Been there, done that. This time I yearned for something fresh. The late summer sun is beating through the windows, and the air conditioning never seems to shut off. That’s when it hit me: gazpacho! Classically made with tomatoes, gazpacho is a chilled Spanish soup from fresh ingredients. Throw some fruit and vegetables in a blender and you’re done. Well, you could be done. Typically you are done. But this is Fat and Happy, where we like to see if we can take a dish to the next level without a ton of extra work. The soup alone is really nice, but nice guys finish last. Enter a slice of chorizo. Like James Dean (or Fonzie, depending on your age) showing up — everything just became a little cooler. Fat and Happy cool. 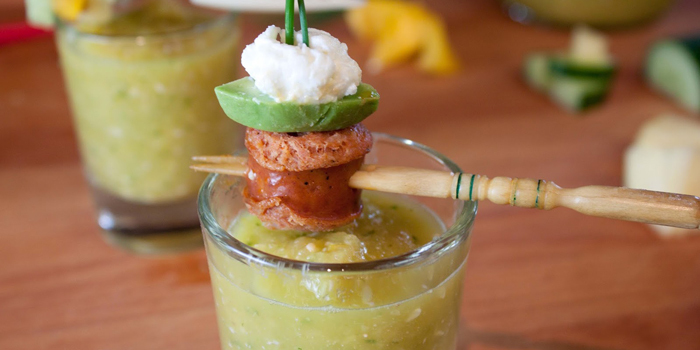 Chorizo, goat cheese and avocado — it’s like a little appetizer for your soup. Stab a piece of pineapple, pepper and cucumber for the vegan option. Make this Fat and Happy chilled soup before summer runs out. T6hen sit back and let the wind blow through your hair. Place the pineapple in a blender or food processor, blend on low until the pineapple is all chopped up, and you have a relatively thick soup. Use a low speed when blending the soup ingredients to avoid whipping too much air into the soup. Pour into a container and set aside. Add all the remaining ingredients (pepper, cucumber, onion, vinegar, seeds, flakes and salt) and blend until you have a thick, soup-like texture. Add the pineapple soup back inand pulse to combine. 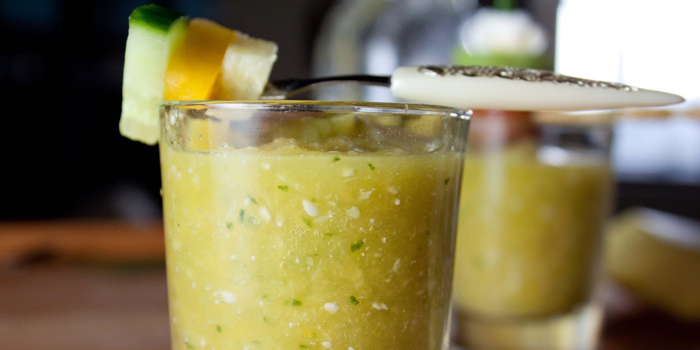 Pour the Pineapple Gazpacho into a glass jar and place in the fridge to rest for at least 2 hours (this helps the flavors meld and develop). Serve in small bowls or glasses with toppings if you desire. Fat and Happy Food Blog Tips and Techniques: Pineapple is an excellent source of vitamin C and manganese. It is also a good source of vitamin B1, vitamin B6, folate, copper and dietary fiber. Cucumber phytonutrients play a key role in providing antioxidant and anti-inflammatory benefits.